Winter Lights at Seneca Creek State Park: Gaithersburg, Md. Winter Lights is a magical Christmas light display at Seneca Creek State Park in Gaithersburg, Md. 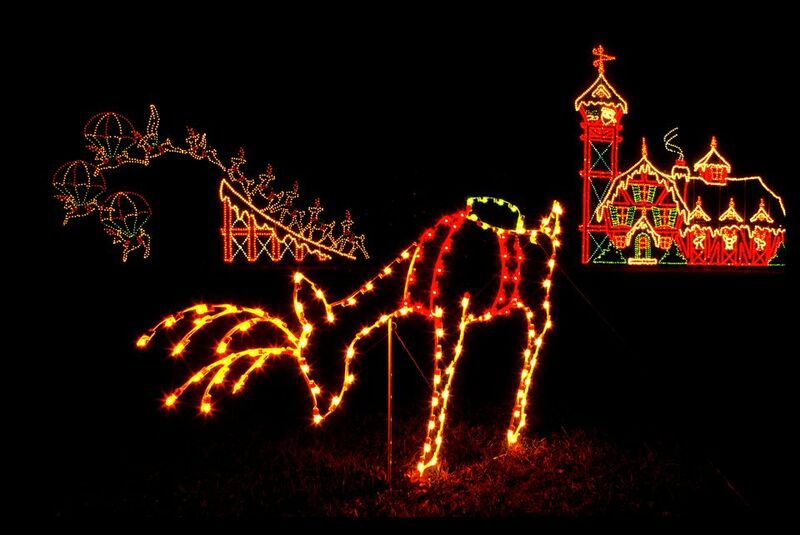 See more than 450 illuminated displays and along a 3.5-mile drive through the park. Driving through the enchanted forest setting, you will experience an array of exhibits that light up the night. Displays over the past years have included a frog prince display, nestled amongst traditional festival favorites that include a Fantasy Castle and magical unicorn fountain, Winter Woods, Teddy Bear Land, Victorian Village, and the North Pole. Themed areas include Winter Woods, Teddy Bear Land, Victorian Village, the North Pole and much more. The Winter Lights benefits local charities. Past beneficiaries have included Baby’s Bounty, Rebuilding Together Montgomery County, Kentlands Community Foundation, Girls on the Run of Montgomery County, and Women Who Care Ministries. See Photos of Winter Lights at Seneca Creek State Park. Seneca Creek State Park is located at 11950 Clopper Road in Gaithersburg. From I-270, take Exit 10, Clopper Road (Route 117). Turn right at the light, proceed for approximately two miles. The park is on the left. On most years, the lights run from Thanksgiving Day through New Year's Eve. The park is closed on Christmas Day. On Sunday through Thursday, the lights are on from 6 to 9 p.m. They're on until 10 p.m. on Saturdays. The price for admission is $12 per car Monday through Thursday and $17 per car Friday through Sunday. Cash and credit cards are accepted. The park also hosts several various holiday-themed events in the lead-up to Christmas. S’more Lights: Begin your adventure with family and friends as you roast marshmallows over a campfire and make delicious s’mores in a beautiful woodland setting. At your leisure, take a trolley or wagon ride through a wonderland of sparkling trees, illuminated arches and animated vignettes that include traditional favorites and a new frog prince display. Take selfies with Santa under a heated tent while enjoying hot beverages. Admission is $12, and the event is typically held in mid-November. Wine Under the Lights: Bring a blanket for a cozy three-mile open-air trolley ride either before or after you enjoy wine tasting from three local vineyards, food bites, live music and a beautiful selfie station with fun props inside a heated tent. The tasting package costs $28 and includes 12 tasting tickets, a souvenir glass, light snacks, hot drinks, live music, and a trolley ride. A non-tasting package is available for $18 and does not include wine tasting tickets. Preregistration is strongly recommended as admission is limited. Leashes ‘n’ Lights: Bond with your favorite canine as you experience more than 450 magical light displays. Browse dog-related vendors, enjoy hot drinks and take a pet selfie with Santa under a heated tent. Admission is $10. This is one of many spectacular holiday light displays in the capital region. For more places to celebrate the season, see a guide to Christmas Light Displays in the Washington, D.C., Area.